“It’s our grand reopening. 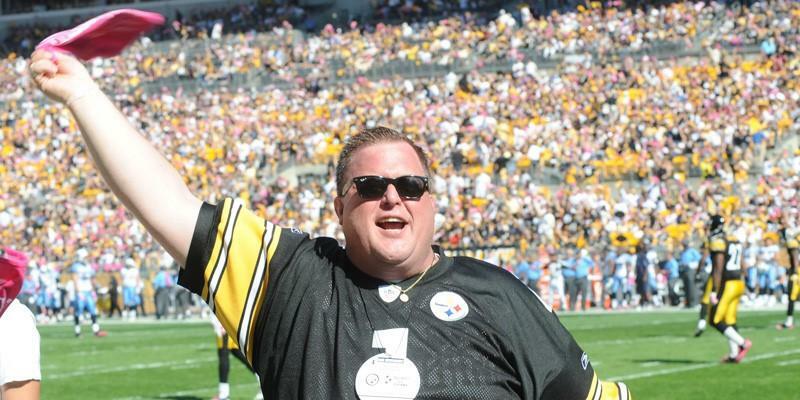 It starts TONIGHT!” — Billy Gardell (actor and comedian), before the game last night. 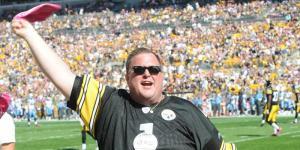 Mr. Gardell, a big Steelers fan, was on hand for the Terrible Towel Twirl. Mr. Gardell sure was right! The Steelers were on target in all phases of the game. Oh, and did we mention a certain 99 and his INTERCEPTION? OUR 99, that is. It’s being coined “Beardception” and it was a beauty. 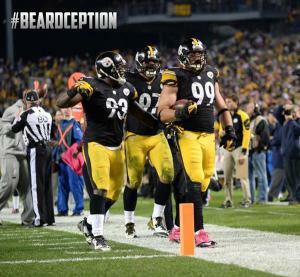 After a takeaway by the Steelers defense led to another quick touchdown, Keisel turned in one of the plays of the game. With just more than a minute left in the first half, Keisel redirected a Fitzpatrick pass when the Texans weren’t content to run out the clock and go into the locker room trailing by four points. After Fitzpatrick’s pass clanked off the face mask of linebacker Lawrence Timmons, it landed in one of Keisel’s ample mitts. Brett ran the ball 16 yards, setting up a Steelers offensive touchdown. Did we not describe how this crazy play happened well enough? Watch how it unfolded HERE. 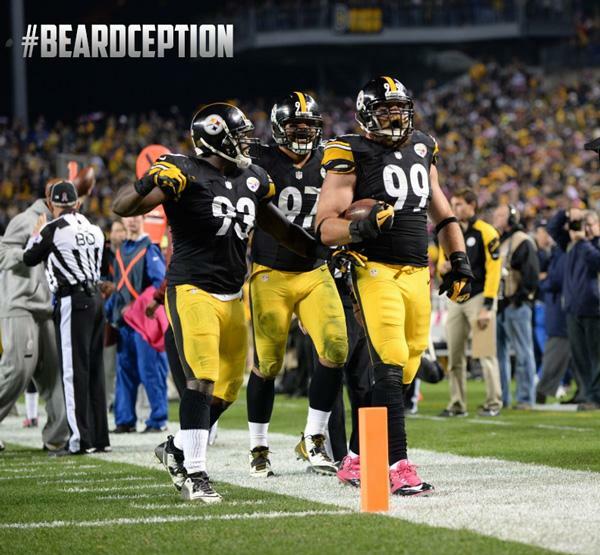 Brett Keisel’s key plays turn J.J. Watt into ‘the other No. 99′ in Steelers’ win. The Pittsburgh Steelers made a statement Monday night, pulling their season from the brink shortly after boos had rained down on them in their own stadium. Defensive end Cameron Heyward made an even bigger statement after the Steelers overcame an early 13-0 deficit and held off the Houston Texans 30-23 at Heinz Field. Such a statement would seem ridiculous on the surface. Watt, as the Steelers could attest after improving to 4-3, can be contained only to a certain degree. The Steelers largely did a good job against the 6-foot-5, 289-pounder, and he still finished with three tackles, a sack, two quarterback hurries and a fumble recovery. Brett Keisel’s interception led to the third Steelers touchdown during the final two minutes of the first half.His stat line easily trumped the one turned in by Keisel. His impact on the game, however, did not. Keisel’s fingerprints were all over one of the more bizarre stretches in the history of Heinz Field, one in which the Steelers needed just five plays and less than two minutes of possession to put together three touchdown drives. The Texans never recovered from that barrage of points. 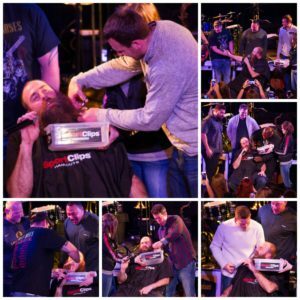 All talk about Texans #99 but we have our own #99 (Brett Keisel) & he can do 1 handed INTs too! We will have much more to post, including Brett’s post game interview, so be sure to stop back.